The day-to-day life of an NYC mom. I see it, both literally and figuratively. The light at the end of the seemingly never-ending tunnel of winter is visible and getting closer each day. The changing of the clocks (annoying as it might be) ushered in with it a changing of the weather. The sun has been shining on and off for the past three days. THIS is the part of winter when hope returns. The day has arrived when the end is in sight and you realize that we’ll get there eventually. Yesterday I left the house with no hat, no gloves, and no boots! I wore sunglasses. 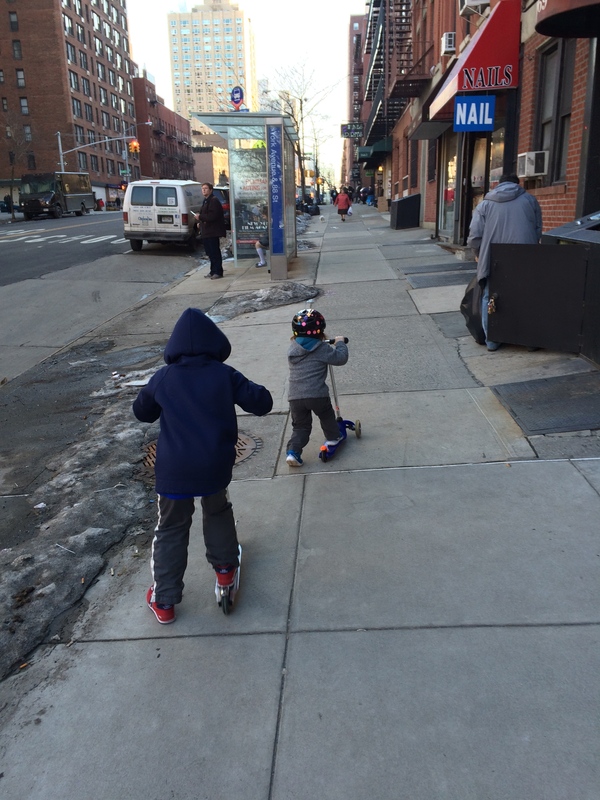 I took the kids on their scooters around the neighborhood after school. The hideous black mountains have ben reduced to hills surrounded by puddles filled with cigarette butts that are rapidly being rinsed away by the store owner’s hoses each morning. I’m sure there will still be some bumps and potholes on the way out. This is probably not the end of hats and gloves quite yet. I’ve yet to see the first green tendrils pushing up through snow. But I’m hopeful that it’s coming soon. I hate “spring ahead”. “Spring Ahead!!! !” Like it’s something happy, excitement in two words. I do not need to get up an hour early every day until I get used to it. There is no coffee strong enough for that. And it took me so long to get back to this that the weather has changed again! Spring ahead is crap, especially when there is no spring weather to go with it! © Momseyeviewnyc, 2008-2014. Unauthorized use and/or duplication of this material without express and written permission from this blog’s author and/or owner is strictly prohibited. Excerpts and links may be used, provided that full and clear credit is given to Momseyeviewnyc with appropriate and specific direction to the original content.